Can a long-extinct species be resurrected? Ugobe designers and engineers studied the long extinct Camarasaurus, a dinosaur from the Jurassic period. Pleo, a Ugobe Life Form is the authentic recreation born from that study. 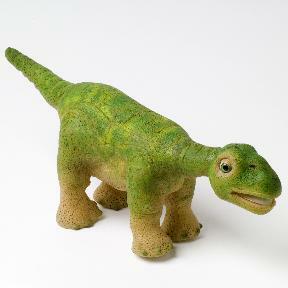 UGOBE's designers and engineers recreated Pleo's physiology from the fossils of the original. His height and weight are consistent with that of a one-week old infant camarasuarus. " Seems to be a bit slugish, it would be more realistic if its motions were faster.